This entry was posted in Accountability, Common Core tests, Corporate education reform, ELA (English-language arts), English-language learners, ESL, High-stakes testing, John King, Student morale, Teacher morale, Tester, Tester not teacher, Uncategorized by katielapham. Bookmark the permalink. Thank you so much for sharing your experience in the classroom over the past 3 days while administering the NYS ELA tests. After day 1, we refused to allow our 3rd grade daughter to continue the test and have no regrets about our decision. 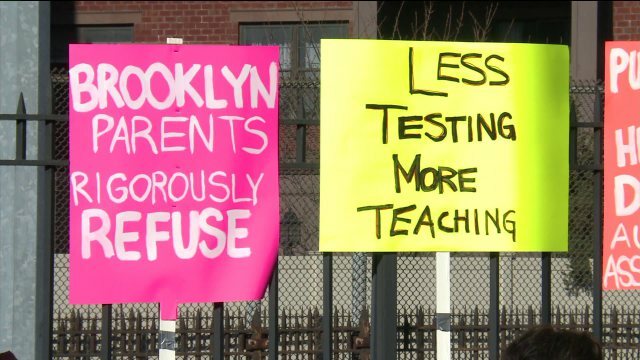 I completely agree that these tests are abusive and as a teacher myself, it is certainly heartbreaking to watch this process unfold. Please continue to document your experiences and share them with others. I have learned so much as a teacher and parent this week- reading your posts affirms everything so many of us believe in. Thank you for writing about your experience in administering the new state tests. I teach high school ESL in Hells Kitchen and I spend so much time preparing my students for the NYSESLAT, and their regents exams. The level of anxiety that I witness every year from my ELLs breaks my heart. A student with very limited English SHOULD NOT have to take these exams. It is abuse! Im glad I found your blog and will continue to read it. I wish some of our non English speaking parents knew that they can have their child opt out of these CC tests. So many of the parents I encounter have so much faith in the system and don’t know otherwise because of the language barrier. Is this the case with your students’ parents? I’d like to know how many ELLs opted out of the test in your school. I’ve never seen a test like this… even last years 2013 was way easier! The short responses had no meaning in it, and they expect us to complete the test within 90 minutes (it looked like it would take me 2 hours)! What makes it eccentric is the essay was a piece of cake… I only had FIVE (5) minutes left to check my work! And Ms. Katie, you’ve done a great job writing this editorial. Let’s remove the standards that are grade-inappropriate! I’ve been learning about standardized tests and it’s refreshing to hear a first-hand account from a teacher who saw students endure through these exams. It through me back to my past experience taking tests in a gym full of rows and rows of tables and chairs. Your account was painful to read, which really speaks to how hard it must have been for such young students. Whenever I read or hear about these standardized tests, I always can’t resist but ask how well did the children of officials who made these ridiculous policies fend through such exams. Then I scoff and say to myself, “they probably go to private schools.” But for the students who cried, had a nervous breakdown, or frequented the bathroom, I feel like they DO need some real exam experiences to fend off that fear of lengthy tests. It’s just that they don’t need to prepare for this when they’re in fifth grade.